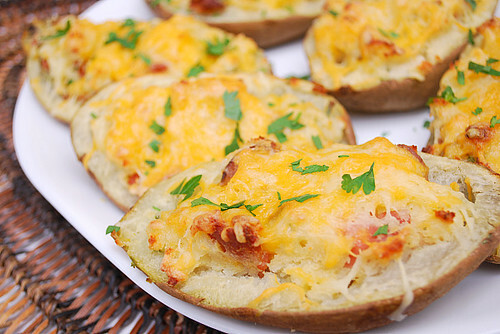 In essence, these potatoes are a twist on loaded baked potatoes topped with cheddar cheese, sour cream, scallions, and crispy bacon. Rather than topping the potatoes with these great ingredients, I made a mashed potato mixture with these tasty tidbits mixed in. 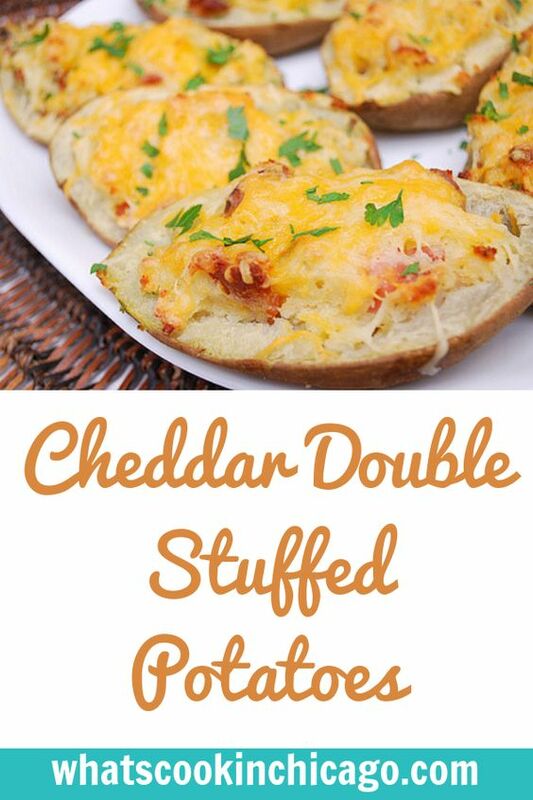 This created my filling that I filled the potato shells with... and I topped the filled potatoes with another healthy dose of more cheddar cheese before baking. The result is a delicious potato side dish that could even be a meal in itself if you use extra large potatoes. Preheat a small nonstick pan over medium high heat. Rub potatoes with a drizzle of oil. Place potatoes on a microwave safe plate and microwave on high for 12 minutes, rotating once. While potatoes cook, add chopped bacon to hot skillet and brown until bits are crisp. Add scallions and cook scallions together with bacon 1 minute more. Transfer bacon bits and green onions to a paper towel lined plate to drain. Allow potatoes to cool enough to be handled, 5 minutes. Preheat broiler to high. Cut potatoes in half and scoop out the flesh into a small bowl. Smash potato flesh together with sour cream until combined using a potato masher. Stir in 1 cup of cheddar cheese, bacon and scallions and season with salt and pepper, to your taste. Scoop filling back into potato skins, top with additional cheddar cheese and place on a cookie sheet. Place potatoes in oven and brown under broiler, 6 inches from heat for 5 minutes. Oh I love this recipe, Joelen. I just need a reminder every now and again as to how much!!! I Better bookmark this right now.